There are limited buses from Kinpun to Yangon, each taking 4-5 hours depending on the traffic in Yangon, which is usually crazy! 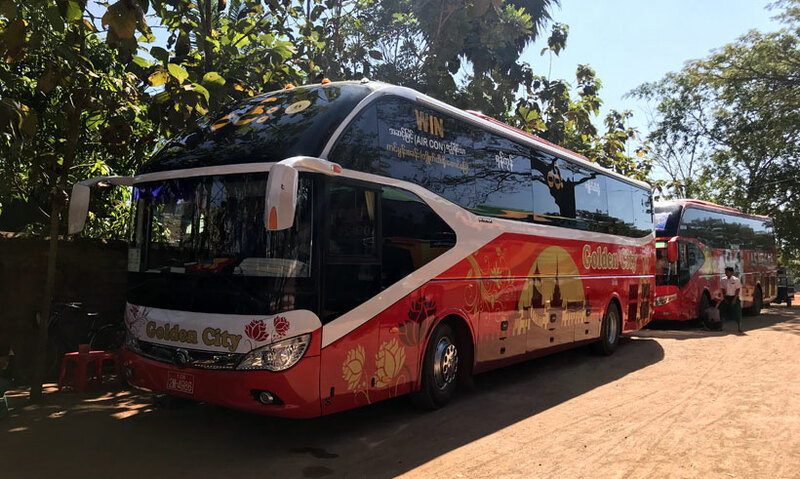 Buses run at 8:30am, 11am, 12pm, 2pm and 4pm from Kinpun to Yangon’s Mingalar bus station. One way luxury bus (without any toilet facilities in the bus) costs MMK 7,000 per person. It’s advisable to book a seat on the bus at least 16-20 hours before your departure time to be able to secure a good seat. So having booked this previous day through my hotel, I was set to take the 11am bus from Kinpun, reaching Yangon’s Mingalar bus station by 3pm. My outbound flight from Yangon’s International airport (RGN) was at 7:10pm the same day, for which I had to be at the airport latest by 5pm. So the bus starting at 11am from Kinpun would give me some buffer time in case of traffic in Yangon. Within 20 minutes of starting from Kinpun, the bus stopped for 20-minutes at a pagoda for the passengers to pay their respects on that auspicious day. And another 1-hour stop at a road-side restaurant for lunch. At this time, I was panicking about not being able to make it to airport for my flight on time. With my eyes on the Google map app on my phone, I was getting more anxious because the bus makes many quick stops to let passengers in and out! And as we reached Yangon, the traffic got worse!! It was past 4:30pm when we reached Yangon’s Mingalar bus station, and without wasting a minute, I got in a taxi to head to the airport. Of course, there was more traffic on the way, but the taxi driver knew some shortcuts through small, bumpy roads that made me reach the airport at 5pm.